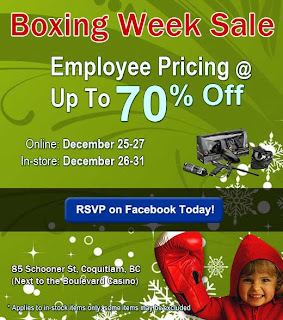 This year Paintball Gear Canada is continuing its yearly tradition of holding a Boxing Week sale. 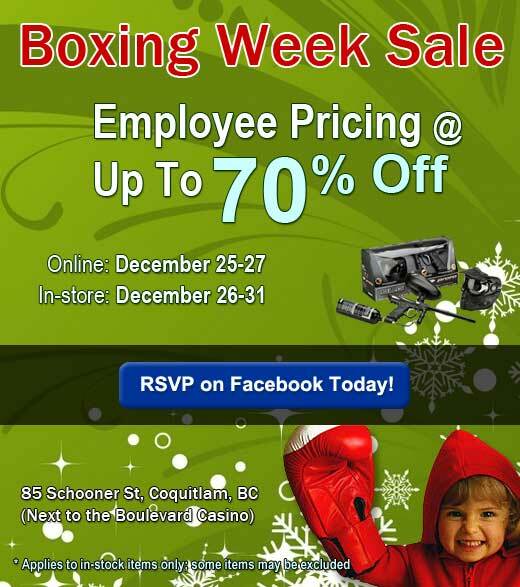 From December 25-27 you can take advantage of employee pricing online (December 26-31 in-store). Their sister store, Tactical Paintball, is holding the same sale event as well. As an example of the price reductions you can expect, a BT TM7, normally priced at $389.99 CDN, is selling for $300.00 CDN. Other examples are Ninja 13ci 3000psi tanks for $47.00 CDN, thermal lenses for around $20.00 CDN, and Pure Energy 48ci "steelie" tanks for $32.00 CDN! And as always, any order totalling $150.00 or more before taxes ships for free. Savings like these are hard to pass up, so be sure to visit their web site or brick & mortar store over the next few days!